IMS Company - Metal Wash, 1.75 lbs (800 ml) Can Heavy Duty Alkaline Metal Cleaner and Degreaser in Powder Form. Ideal for Removing Hydrocarbons, Oil and Greasy Contaminants, Drawing and Buffing Compounds, and Machinery Oils. 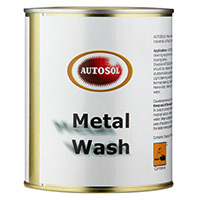 Contains Multi Metal Corrosion Inhibitors to Prevent Flash Rust After Cleaning.